Workspace Technology offers a wide range of data centre cooling and air conditioning technology to support a variety of applications and environments. Data Centre Cooling represents a significant energy overhead to a data centre, our proven mission critical cooling solutions will help maximise your energy efficiency through the deployment of low energy and free cooling technology. Data Centre Cooling systems offered by Workspace Technology include traditional Perimeter Computer Room Air Conditioning (CRAC) units, InRow, On-Rack/Rear Door, Overhead Cooling systems and our award winning Freecool® evaporative fresh air free cooling technology. Our Design Team will select the most appropriate technology to suit individual client applications to deliver optimal data centre performance. We also offer a wide range of airflow management systems to complement and enhance our data centre cooling technology offer. Airflow management systems include floor brush grommets, blanking panels, baffle systems and aisle containment systems. Freecool® is the industry leading low energy evaporative fresh air cooling by Workspace Technology. Freecool® evaporative free air cooling delivers innovative low energy cooling for a range of applications including data centre environments. Freecool® offers clients a choice of direct and indirect airflow configurations. The optional 'Cool Wall' module supports mechanical backup or top up cooling for all modes of system operation. Click here to view our Freecool® brochure. Workspace Technology offers Excool the UK’s leading adiabatic indirect fresh air cooling technology that delivers exceptional PUE performance whilst benefiting from indirect cooling eliminating the need to deliver external air into the data centre. Click here to view our Excool brochure. The latest generation direct exchange and chilled water Multi-Denco and Ultra-Denco full function close control perimeter data centre cooling systems are designed to be used for cooling of data centre and server room environments. 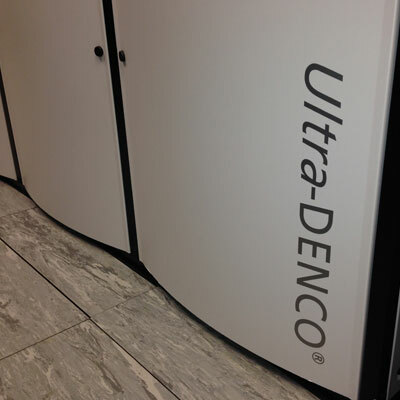 Multi-Denco and Ultra-Denco offer high energy efficiency thanks to EC fan drives, inverter speed controlled compressors and pure sensible cooling due to a large heat exchanger surface. Where high-density rack cooling is required, Rear Rack Cooling or Rear Door Heat Exchanger data centre cooling technology provides an ideal solution replacing the traditional approach to data centre cooling. Chilled water Rear Rack systems can be deployed to support loads of up to 58 kW per equipment cabinet. Based on the principle of moving the cooling unit closer to the source of heat generation, InRow data centre cooling solutions by APC provides energy efficient cooling for server room, computer room and data centre environments. Direct exchange and chilled water InRow cooling options are available to support a variety of data centre densities and applications. Click here to view Schneider Electric InRow Cooling brochure. Data Centre Aisle Containment Systems - FlexAisle aisle containment systems provide a simple and cost effective passive method for eliminating the mixing of hot and cold airflows within a Data Centre or Server Room environment. Passive Airflow Management - Workspace Technology provides a range of passive airflow management products including: Koldlok raised floor brush grommets designed to help seal the floor and prevent leakage of air where cables are routed into equipment cabinets. Blanking Panels which should be installed where there are gaps between equipment within cabinets. The installation of these units will significantly reduce mixing of exhaust and cool air and compliment data centre cooling systems. Air Distribution Products - We also offer a range of supplementary cooling products including fan assisted tiles, rack air distribution and air removal products to help enhance and improve airflow when appropriate. Click here to view our FlexAisle brochure.